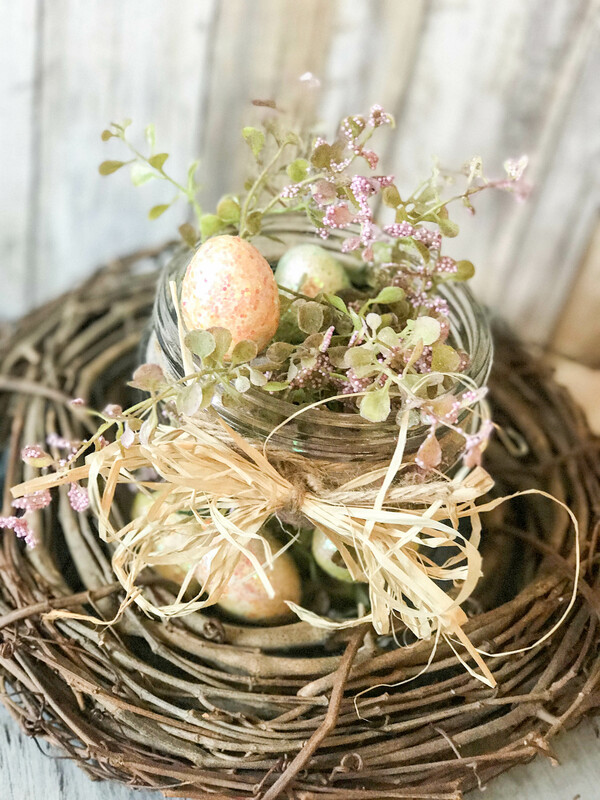 Today’s blog post came along because of an easter table decor major FAIL. I had a really cute (or so I thought) idea that I wanted to share with you all, and I spent a good hour of my life working on it…but it was a complete FLOP. I tried to make myself believe it wasn’t but there was no denying it. In the midst of my frustration that I had just wasted so much of my time, I decided to go a completely different route. It came about by accident, and at first- I thought, “Is this too simple?” BUT, as you know- my motto is “Ain’t nobody got time for hard projects”, and I think that is why my first one failed. I was trying too hard! 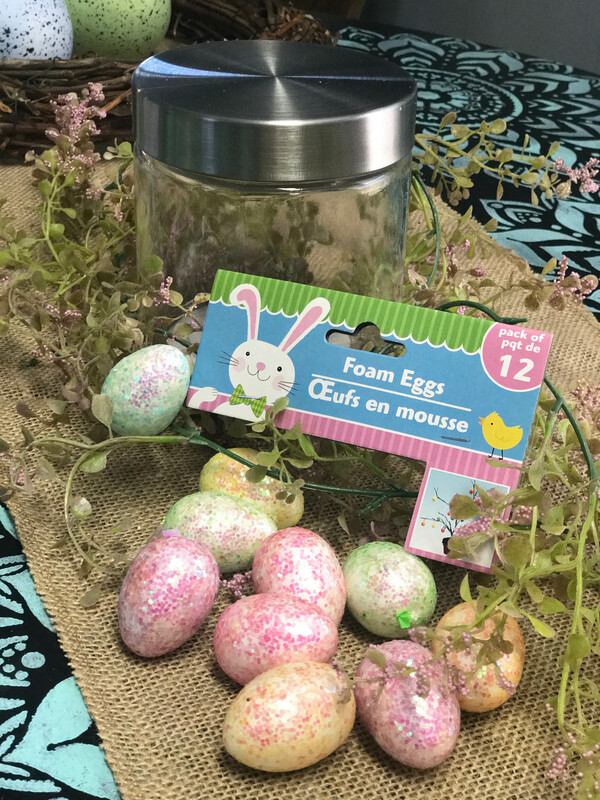 So, I pulled together a very simple and cute Easter decoration that can be used anywhere around your home! 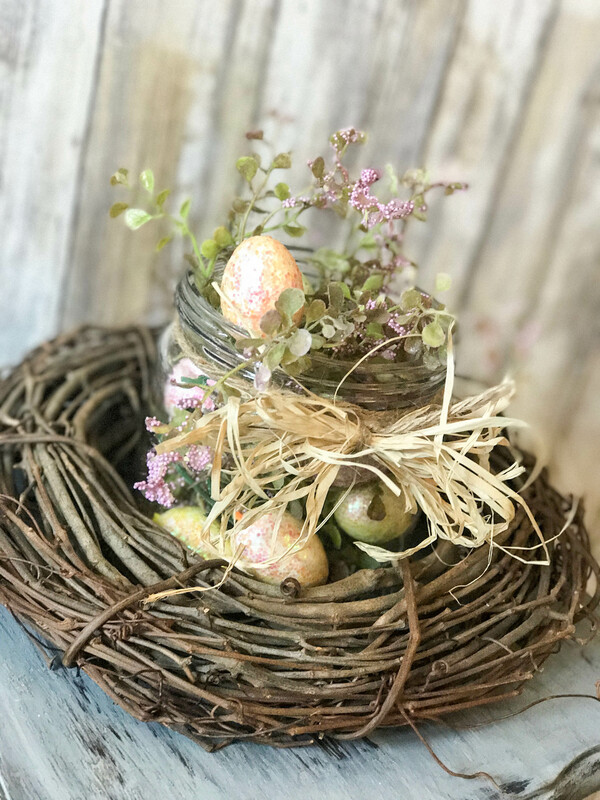 I can picture it sitting in the middle of your table or on a beautiful Easter tablescape…really just anywhere. 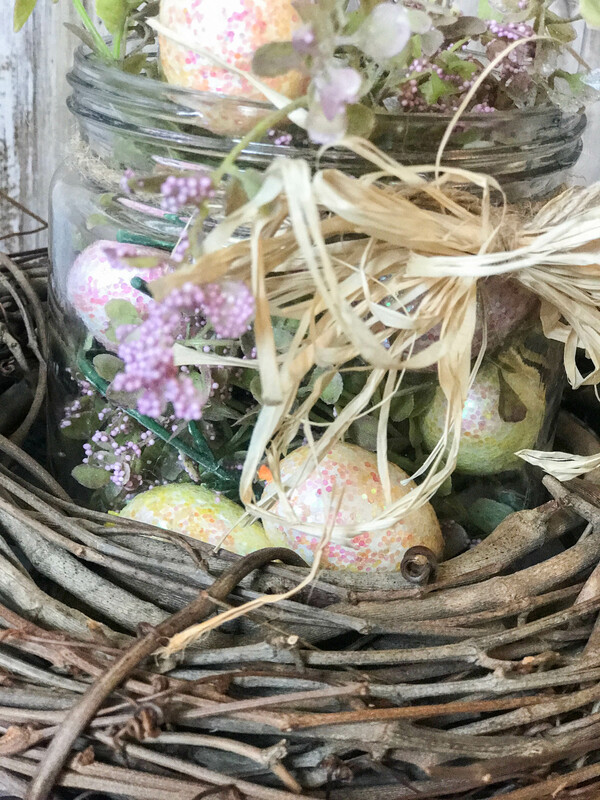 ALL I did here was simply put a few eggs into my canister and then begin to put my greenery in, wrapping it around in there and adding more eggs as I went! BOOM! That is all. Told you it was SO SIMPLE. I love how it turned out! 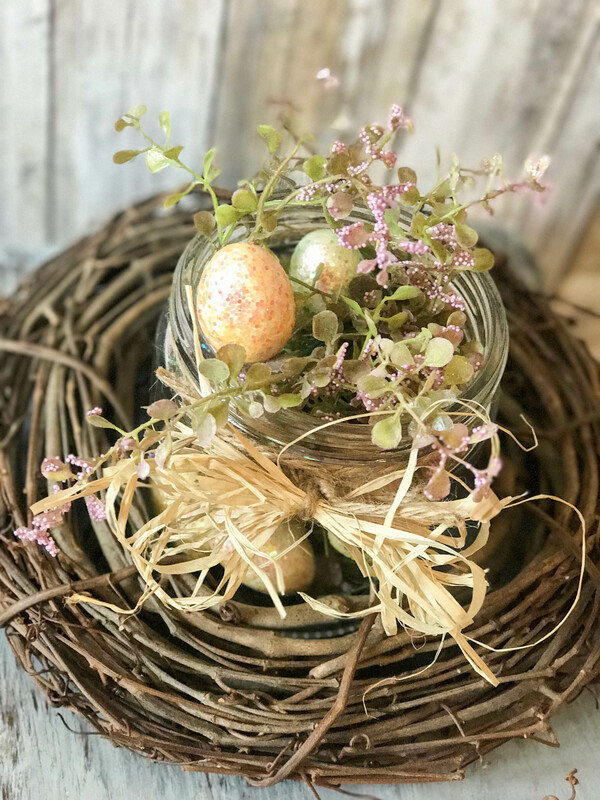 I sat the canister inside of the grapevine wreath just for better visual effect…and it was the perfect size. You can love or leave that part. The raffia bow was an addition that I made because I am a firm believer that everything looks better with a little raffia! So, there ya have it! 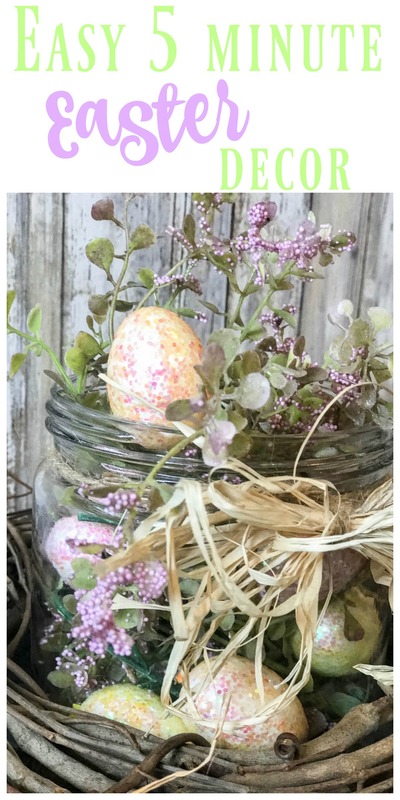 About the easiest Easter decor you can come up with! Also, a mason jar is perfect for this too! 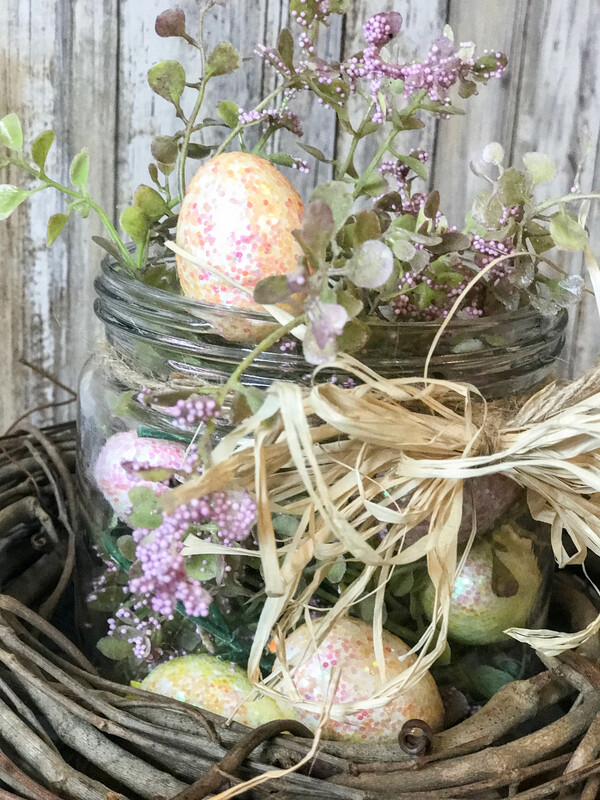 If you like it this super EASY Easter table decor, then put a PIN ON IT! Be sure to follow along on Social Media! Brooke, one of these days, I’m going to have to come by and see in person, all the neat and creative things you are doing. Maybe you should just come over here and restart me! lol……..Im just around the corner on Spence Chapel Rd. That is so pretty. I just love to watch you make things. Lovely idea I’m making these for my sisters & sister in-laws 6 in all with myself. Love this! I think even I could pull this off!